Personal experience can influence our attitudes and actions concerning climate change. This paper examines the experience-perception link in relation to tropical cyclones using a distinctly revealed preference approach, mitigating biases of prior research in this area. Specifically, we study how people alter their internet searches related to climate change in response to tropical cyclones. Using data for the United States 2006–2012, results suggest that searches related to climate change increase with a lag in the months following an event. 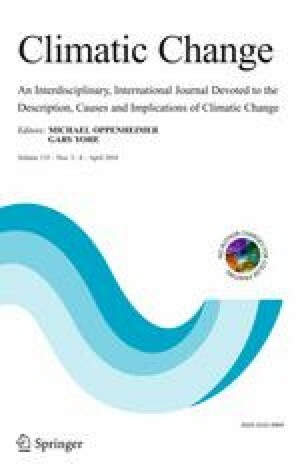 This finding indicates that the people are connecting tropical cyclones to the broader narrative of climate change in the aftermath of an event and there may be a window of opportunity for building public support for policy action. Carrie Gill is thanked for excellent research assistance. Laura Bakkensen and three anonymous referees are thanked for useful comments. This paper is a contribution of the Rhode Island Agricultural Experiment Station (#5431). Lang conceived of the research. Ryder performed analyses. Lang and Ryder co-wrote paper.